Naumes Inc. was established in 1946 by Joe Naumes and Steve Nye after both men returned from active duty in World War II. Joe, having served in the Pacific with the Navy and Steve in Europe with the Army. Originally established as a packing company called Nye and Naumes Co. Inc., it eventually acquired orchards and soon packed only its own product. In the early 60’s the Naumes Family bought out the Nyes. In the early 70’s the next generation returned from college and graduate schools and began work. 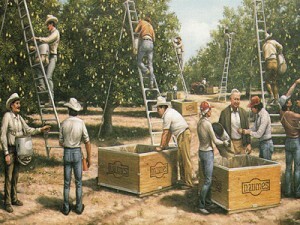 By the mid 70’s the first California Orchard was acquired from the former C.E. Sullivan ranch in Yuba City, California. 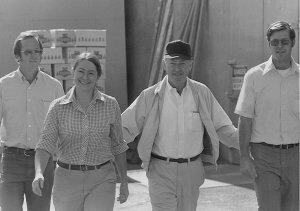 In 1978, the last of the Di Giorgio Company’s farming operations were acquired across the river in Marysville bringing the California operations to 2,500 acres. In the early 80’s the Chelan Apple Co. and the J.K. McArthur & Sons Co. were aquired in North Central Washington. The company was now farming nearly 7,500 acres. Joe Naumes Died in 1989. In the early 90’s juice concentrate plants were added in Marysville and Wapato. Succeeding generations of “Naumi” have learned their trade from the ground up. Joe’s children — Mary Pat, Sue and Mike — started moving irrigation pipe at 11 years of age and were picking, thinning and smudging by the eighth grade. Mike and his wife, Laura, who also grew up in the orchard business, now oversee the operations that encumpass approximately 5,300 acres in three states. Sue is enjoying retirement after a dedicated and long-term involvment in the family business. Joe Naumes formed the company, but it all began long before that when grandfather, Peter Naumes, set foot on rich Oregon soil at the turn of the century. We are fruit growers of the Tribe of Treverians who were tamed by Constantine the Great in 327 AD and taught to speak Latin. We call ourselves NAUMES today and speak English and Spanish. Grandfather Peter Naumes, son of immigrants, and railroader with the Chicago North Shore in 1907, lined up with the losers in a management dispute. The winners told him to “Go West Young Man” and grow apples. So he got off the train at Hood River, became renowned for his Newtowns, and an expert at exports. The Great World War didn’t help the apple business, so after 22 years, he moved to Medford to cash in on growing popularity of pears. This was just in time for the stock market crash and beginning of the Great Depression! We survived. Peter’s middle son, Joe, sailed a desk for the U.S. Navy, 1942-1946, coming home a Lieutenant Commander to start his own pear business. By 1972 when Peter’s grandchildren, Pete, Mike and Sue came aboard, we were looking for new challenges (Pete and Mike with Vietnam experience and MBA’s, Sue with a J.D. and a membership in the Oregon Bar.) The Mother Lode country of California seemed a promising El Dorado. There, we found right next to the Yuba Goldfields, the last fruit properties of the DiGiorgio empire. With this purchase at that time (yes, there is gold under our property) we became one of the largest pear growers in the world.